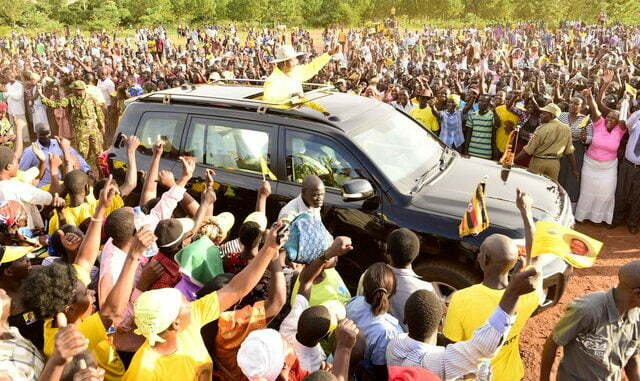 President Museveni campaigning for Watongola in Kamuli municipality on Monday evening. Courtesy Photo. 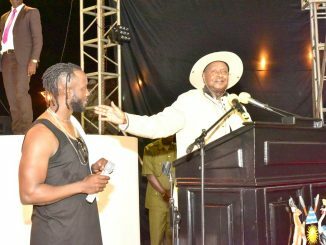 President Yoweri Museveni and his four-time challenger, Dr Kizza Besigye, were back on the campaign trail on Monday as they canvassed for votes in Kamuli Municipality by-election. Both politicians addressed rallies on Monday evening appealing to the voters to send their respective party flag bearers to parliament. 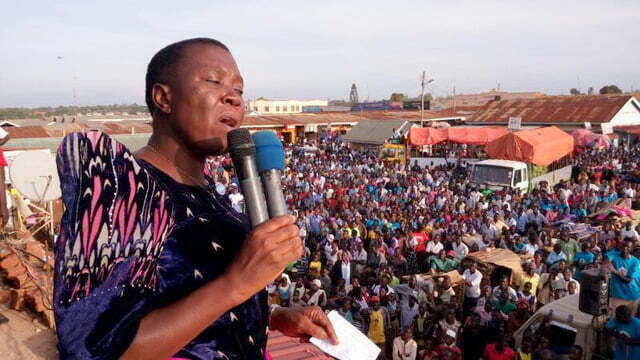 The ruling National Resistance Movement (NRM) is fielding Rehema Watongola while Proscovia Salaamu Musumba is standing on the opposition Forum for Democratic Change (FDC). The seat fell vacant after the Court of Appeal nullified the election of Watongola over lack of requisite academic papers. 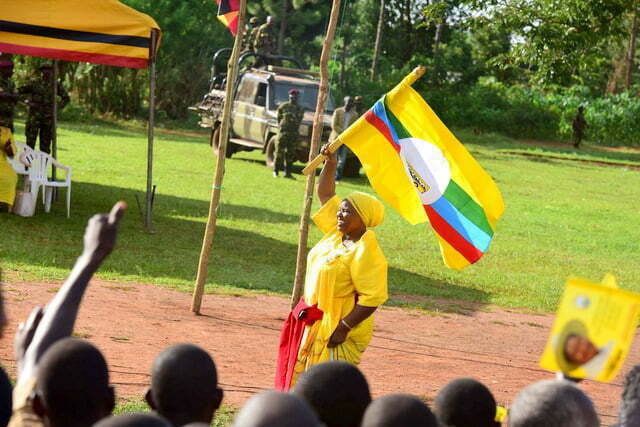 National Resistance Movement (NRM) flag bearer Rehema Watongola. Courtesy Photo. 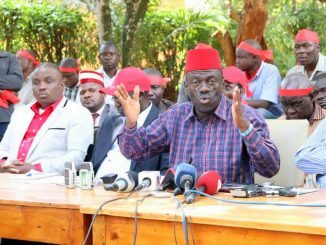 Dr. Besigye, the former FDC president who has challenged Museveni for the top seat in the last four elections, was joined by other opposition leaders including Kampala Lord Mayor Erias Lukwago on the campaign trail. They arrived in Kamuli at around 2pm to campaign for Salaamu Musumba. The presence of both Besigye and Museveni, however, brought excitement and tension in Kamuli town forcing police to block some of the roads. Particularly Besigye and his team were blocked from using Kamuli main road because it had been reserved for the president. In the process, according to the Busoga South police spokesperson, Michael Kasadha, more than ten people were arrested for allegedly inciting violence. Besigye and his team complained why the police was blocking them and yet police knew that this was the last day for campaigns. Forum for Democratic Change (FDC) Proscovia Salaamu Musumba campaign in Kamuli. Courtesy Photo. After a while police allowed Besigye and his team to proceed to Nankulyaaku Primary School for Musumba’s campaigns. While there, Besigye rallied voters not to allow police intimidation. Meanwhile President Museveni who arrived in Kamuli at around 3:30 pm addressed three rallies. He appealed to voters to elect someone because of their ability and not because they know them in person. While campaigning for Watongola at Kamuli district headquarters, the President said that an NRM flag bearer would benefit the people of Kamuli because they will be in position to bargain for the people directly. As the election day approaches on Wednesday, the race seems to be between Watongola and Musumba, with other candidates crowded out. 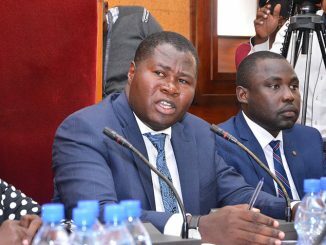 The others include independent candidates Samuel Walujjo, Michael Kiboome and Prossy Naikoba Kanakutanda.